What Are Vehicle & Axle Weigh Pads? Coventry Scale Company are one of the largest independent suppliers of Dini Argeo portable weigh pads. The WWS series of axle weigh pads are designed to weigh vehicles of any size, quickly and easily. A set of two Dini Argeo weigh pads can be used to weigh a vehicle, one axle at a time. Our weight indicator will accumulate the weight of each axle to provide a report of the each individual wheel, each axle and the total sum. This process can be set to both static and dynamic axle weighing, where you can simply drive your vehicle over the pads. We offer both cabled and wireless weigh pads in a variety of platform sizes and capacities, to cater for every type of vehicle. There is also a choice of weight indicator to meet your requirement, the DFWKRP will display the wheel, axle and total vehicle weights along with a simple print out. The 3590ETKR is completely customisable, you can store your customer database, product database and vehicle database. This indicator is very popular with vehicle modification engineers due to the centre of gravity feature. If you have any question regarding axel weighing, contact our support team today. Weigh pads are used to determine the individual axle weights and total gross weight of any type of vehicle. An axle weigh pad system typically consists of one pair of 20 ton portable weigh pads weighing in 5kg increments and a weigh indicator with printer. Axle weigh pads are generally used to determine if a vehicle is within the legal weight limits for travelling on UK roads. If a vehicle is found to exceed the maximum legal axle weight or total gross weight then the driver may be issues with a fixed penalty notice or reported for prosecution. 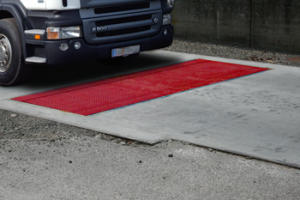 Axle weigh pads provide a portable and cost effective solution for weighing vehicles of any size, shape and weight. Vehicle weigh pads are a fraction of the cost of a full weighbridge and provide better accuracy as a weighbridge can only display the gross weight of a vehicle. 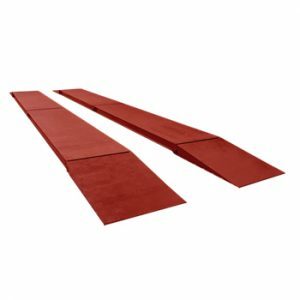 The WWS series of vehicle and axle weigh pads are able to provide individual wheel weights, individual axle weights and accumulate a total weight of the car, van, lorry or trailer that is being weighed. The WWS series of vehicle weighing scales are available in five different sizes with cabled analogue connection and three different sizes with wireless radio frequency connection. There is now an option for weigh pads with connection via Bluetooth. The WWS range of cabled weigh pads offer an accurate solution when using a set of four to weigh a complete vehicle, or as a set of two pads, weighing a vehicle axle by axle. The WWS cables weigh pads come with high quality cables with IP68 connectors throughout and are perfect for outdoor use or harsh environments. The only real drawback to the cabled connection weigh pads are they are limited to a maximum of four weigh pads per system when connected to one of the different main display readouts such as the popular DFWKRP or the 3590ETKR touch screen display. If you need to weigh a complete vehicle with three or more axles then the only options are the wireless version. The wireless range of WWS vehicle weighing scales are available in three different sizes to accommodate any type of vehicle. The WWS series come with IP68 protection throughout and each pad has its own internal rechargeable battery offering 40 hour’s use from a single charge. Each of the pads has its own built in display as well as wireless connectivity via radio frequency to a central display. A maximum of 20 individual weigh pads can be connected at any one time meaning a vehicle with ten axles can be accurately weighed down to individual wheel weights. New to the CSC weigh pad range are the WWS “dual” wheel & axle weighing platforms with Bluetooth connectivity. A single analogue weigh pad can be connected via a short cable to a wireless WWS weigh pad, the wireless weigh pads built in display with give a total of both of the weigh pads. 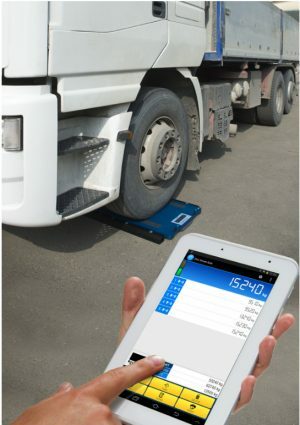 Once fitted with a Bluetooth connection, the wireless weigh pad can communicate to a smartphone or tablet using the Smart Axle app to give a complete solution for axle weighing.